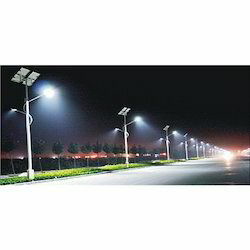 With our expertise in this domain, we are able to offer a superior quality range of Solar CFL Street Lights. The offered range of solar CFL street lights is known for its longer functional life ( 8000 burning hours) and robust construction. In addition to this, the offered range is available in different forms and grades in accordance with the demands of clients. Available with us is a comprehensive range of Solar Street Lights which are endowed with automatic on / off time switch for twilight to down operation and used at road, yards, colonies, campus and townships. These solar street lights are offered with PL-9, PL- 11 and PL-18 lamps and battery storage backup, which guarantees long operational hours of light and are available in the power range of 9 W, 11 W and 18W. Looking for Solar Street Lights ?